Our research facilities include an immersive projection environment referred to as DAVE, a multi touch interaction table, a 3D printer and more. 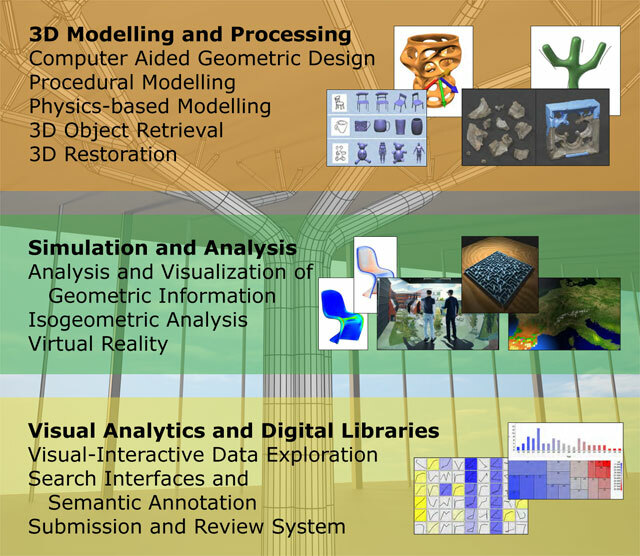 Our groups research and teaching focuses on areas of geometry modeling and processing and digital libraries and research fields related to these, namely, Virtual reality, and Cultural Heritage. 3D Modelling and Processing: © S. Yoon, M. Scherer, T. Schreck, and A. Kuijper. Sketch-based 3D model retrieval using diffusion tensor fields of suggestive contours. In ACM Multimedia, pages 193-200. ACM, 2010. // © TU Graz / S. Havemann // © A. Andreadis, R. Gregor, I. Sipiran, P. Mavridis, G. Papaioannou, and T. Schreck. Fractured 3D object restoration and completion. ACM SIGGRAPH Posters, 2015. // © Riffnaller-Schiefer, Andreas; Augsdörfer, Ursula H.; Fellner, Dieter W. : Isogeometric Analysis for Modelling and Design. Eurographics 2015 Short Paper. Visual Analytics and Digital Libraries: © T. Schreck, T. Tekusova, J. Kohlhammer, and D. Fellner. Trajectory-based visual analysis of large nancial time series data. ACM SIGKDD Explorations, Special Issue on Visual Analytics, 9:30-37, 2007. // L. Zhang, A. Stoel, M. Behrisch, S. MittelstŁadt, T. Schreck, R. Pompl, S. Weber, H. Last, and D. Keim. Visual analytics for the big data era - a comparative review of state-of-the-art commercial systems. In Proc. IEEE Symposium on Visual Analytics Science and Technology, pages 173-182, 2012.